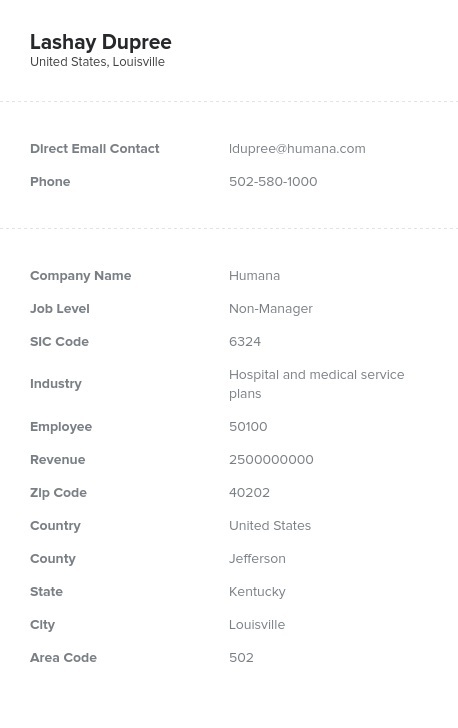 Our hospital and medical insurance industry email database puts the valuable contact information of executives, sales directors, managers and others right at your fingertips. We verify our mailing lists on a weekly basis so you know you're getting up-to-date information. Do you have a product that you want to introduce to professionals working in the health-related insurance field? If so, our targeted hospital and medical insurance email list makes it easy to reach out to influential people in this industry. When you buy an affordable bulk email list here, you will receive names, email addresses, phone numbers, and postal addresses of powerful professionals. In addition, you'll get information about the job function and level of each person. In short, when you purchase email lists from us, you learn everything you need to know about a particular professional before making contact. What if you want to contact a more specific group of professionals? Not to worry: We can help you create a customized hospital insurance mailing list that specifies the job function and title of the individuals you want to contact. Also, you can specify the location, the number of employees, and even a company's range of revenue. You dictate what you want on your B2B email list and we'll give you the verified sales leads you need. Buy this medical insurance mailing list and start establishing communication with people who play an integral role in the hospital and medical insurance field.